If you are a farmer in the Jeparit district, chances are you’ve had a text from Adrian King. The agronomist who part owns SMS Rural in the small Wimmera town of Victoria uses text messages to great effect to get timely information out to his spread of growers. The messages are grouped so lentil growers get relevant information while wheat growers are sent the information that applies to them. While texts provide quick updates, Adrian also likes to visit farms to have one-on-one interactions to provide agronomy advice, especially at the start of the year. 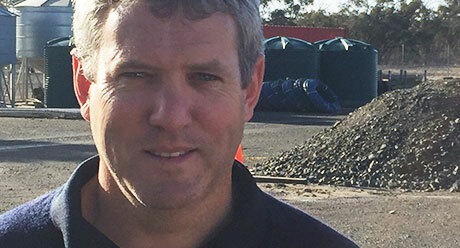 He will sit down with his growers at their kitchen table to make plans for a management program, and he says it is valuable as “we can jump in the ute and go look at a paddock”. Adrian is a believer that small towns need services, and while Jeparit has just 270 people, he is keen to support the area’s farmers by offering agronomy support and a place to buy chemicals locally. In 2014, he initiated self-serve 24-hour fuel bowsers to be installed to ensure the community could access fuel locally. SMS Rural is the only 24-hour fuel outlet within 50km of Jeparit and the only fuel outlet in town. That support he gets from growers is repaid by his involvement in the local community, where he holds roles in the cricket club, the Country Fire Authority, volunteers at the football club and is heavily involved with a charity which provides Christmas presents each year to locals. Adrian is a huge fan of rural Australia and hopes that living and working in a small town and starting up a business shows his commitment to the community. “I am always keen to share the good experiences of living and working in a small town and the benefits of being involved in agriculture,” he says.